Perfect for installations that include a communal chilled water system, the new Evinox Energy chilled water meter kit includes all the equipment required to facilitate commissioning, balancing, and flow control of the chilled water circuit, as well as the accurate measurement of energy consumption. The integrated flushing by-pass allows the chilled water primary circuit to be cleansed and flushed by simply moving the blue lever valve to the off position and the blue T bar lever across the pipe and the apartment circuit. This ensures the Pressure Independent Control Valve (PICV) and meter are protected from the cleansing process of the primaries. The PICV provides flow regulation of the chilled water circuit within the apartment and differential pressure control of the chilled water circuit ensuring that only differential pressure control of the main primary pump set is required. 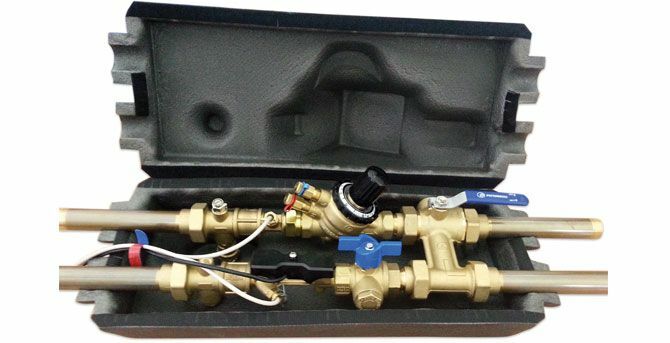 The PICV also features its own binder points for the commissioning engineer to use when required and the in inbuilt isolation valve has an integral strainer. The kit includes a MID approved meter head, which is supplied with a wall mounting bracket that enables the meter head to be installed in a position where it can be read easily, normally below the ceiling level. The meter can also be wired directly back to the Evinox ModuSat heat interface unit, allowing the chilled water consumption to be read via our ViewSmart room controller. The whole chilled water meter kit assembly comes complete with its own sturdy insulation jacket, which allows removal for any maintenance that may be required. For pre-payment operation with our PaySmart system the assembly can be fitted with an actuator to shut down the chilled water circuit in the event of no credit being available.